My last post introduced Olivia … Cue the crickets … Why weren’t there any new Rabbittude updates after that? 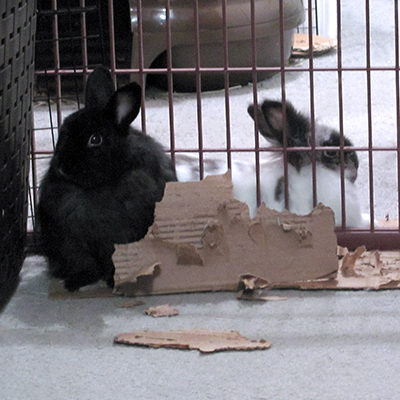 Our one experience bonding rabbits was Tigger and Shadow. Time passed. I forgot the challenge in maintaining separate yet equal spaces for unbonded bunnies. Olivia also has litter box habits that are an added issue. But I digress. Olivia’s pee party ways will be another post. Olivia was still recovering from her spay when we adopted her. We knew it would take some time for her hormones to clear. Leo and Olivia had some first dates late in January 2015. We realized we had misjudged Miss Olivia a bit. She had seemed an easy-going rabbit when we first met her. After settling in, she showed us she had a sassy side too. Leo started out shy and skittish. He lost some skittishness but remains shyer than previous rabbits. Dates were so so. Olivia would try to chase Leo who would run away. There wasn’t aggression or fighting. Leo was more open to Olivia than to another rabbit we had him meet before Olivia. A friend had a rabbit she thought might be a match for Leo. When they met, he didn’t want to share the same space. He tried to climb over me to get away. Then he refused to let me put him down again. The friend left a towel with the bunny’s scent. 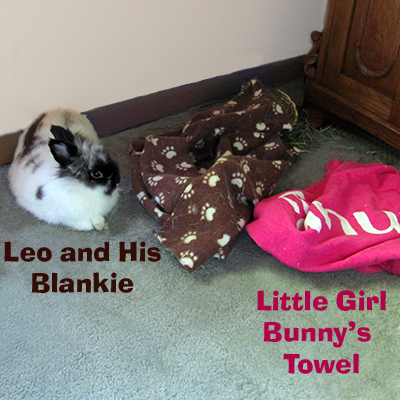 We put the towel near Leo at another time. He dragged his blankie between himself and the towel. With Olivia, Leo was willing to share the same space, but was nervous when Olivia moved around. We decided to take it slow to allow Leo lots of adjustment time. Then Leo experienced problems on and off for several months. His appetite would decrease and then his poops would too, not a good thing in a rabbit. But why was his appetite off? We monitored him closely and took him in for a number of vet visits. No clear cause was found. We stopped dates in case stress played a part. Then he bounced back again. We allowed time to go by to be sure he had recovered. During the summer of 2015, we began some dates again. October rolled around. I had found my groove again between work and rabbit needs. I planned catching up with Rabbittude updates during the end of 2015 with new plans for 2016. Things went awry with a series of unfortunate events and accidents that took months of recovery time as well as lots of money. I didn’t blog because I didn’t want to bore with details, especially when it was harder to find the funny side of anything. Thankfully, both rabbits were healthy and happy to provide distraction. Fur therapy rocks! Spring 2016 arrived bringing lovely weather. I hoped crazy times were over. Then we woke up to a flood. Overnight thousands of gallons of water flowed out of our main water line. From what the plumber saw, it seemed likely a local mowing service had hit an above ground pipe causing a break below ground which leaked unseen for a bit and then blew out the main line. Repairs and a water bill for enough water for an Olympic size pool were tough pills, but at least the flood flowed in a way that didn’t cause damage to anything else. It just would have been nicer if we had paid for water for a pool to enjoy. Ah well. So both humans have worked and worked through spring and summer trying to get ahead of the bills again. I planned a Rabbittude update for August and announced it on the new Rabbittude Instagram account. We had some good dates between Leo and Olivia. Things were looking up. I thought I could meet my schedule for the Rabbittude updates. Then the flying squirrels arrived. I kid you not. This is the year for crazy. Thankfully, my sense of humor began to come back. Having a flood followed by flying squirrels just became too ridiculously nuts to not start seeing some of the humor even though the tickets for the amusement have been high-priced. 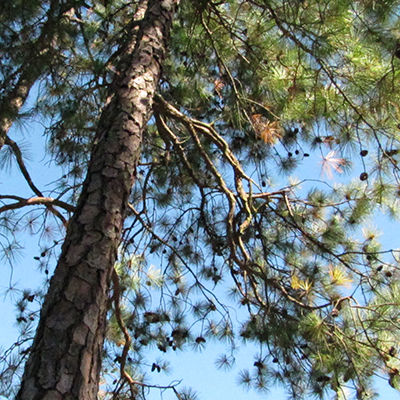 Beautiful pines like these grow in abundance in Georgia. Those trees reaching towards the bright blue sky have been hiding an invasion force, flying squirrels that can launch themselves from tall trees and fly about 150 feet. They chose our roof as their landing pad. Being nocturnal, they did their home invasion under cloak of darkness. They created an entry tunnel in to our attic. So how could we not know they were up there? They were sneaky and chose the part of the roof above the room where Leo and Olivia spend the night. We thought scratching and chewing we heard was the rabbits being noisier than usual. Then we heard something running around inside the walls and knew it was not the rabbits. We found a critter company to evict the squirrels and fix the damage. The company arrived early to seal things up while the squirrels were most likely out for the day. Live traps in the attic have been empty (the company relocates any animals caught). So it seems no squirrel has been left behind. Newly installed metal protection is in place in vulnerable roof areas. The company also sealed and protected areas for our crawl space to prevent any other uninvited critters who might try that route. When we first moved here, we had a couple of mice sneak in to the house from the garage. We jokingly told Tigger and Shadow they were not allowed to have pets. It did not occur to us to tell Leo and Olivia they could not invite flying squirrels in for all night parties. This entry was posted in Leo Bunny Rabbit, Olivia Bunny Rabbit, Rabbittude Updates by Rabbittude. Bookmark the permalink.